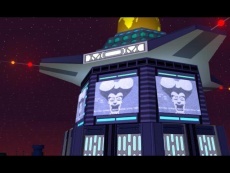 MomCorp is a worldwide company, mostly owned by Mom. The most well known cornerstore of MomCorp, Mom's Friendly Robot Company is the manufacturer of most of the world's robots. They also produce the preferred brand of robot oil, Mom's Old-Fashioned Robot Oil. Mom presents an image to the public of a sweet, kind, frail old woman, but this is a façade maintained for PR. Behind the scenes she rules the company with an iron fist, and will lie, manipulate, and even outright steal in order to make the company succeed. The company is among the leading universal industrial trusts and seems to have the market really cornered. 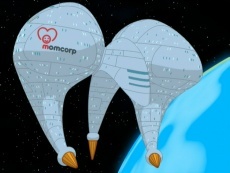 The MomCorp flagship is shaped similarly to Mom's hair. Mom's Friendly Robot Company was known as the Friendly Robot Company in 2801. At that time Mom had not yet been born, unless she is over 200 years old, which is unlikely. Manufactured robot slaves until Robot Lincoln ended robot slavery. The name refers to the Commodore VIC-20, which was advertised as The Friendly Computer. Bender is powered by the MOS 6502 microprocessor, [1ACV13] which is the same Microprocessor (MOS 6502B) the Commodore VIC-20 was powered with. Three of the original members of Planet Express (Professor Farnsworth, Hermes, and Dr. Zoidberg) [1ACV01] have been members of MomCorp. This page was last edited on 21 July 2017, at 08:52.